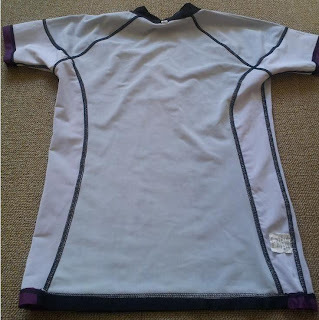 Short Review: This 20% spandex/80% polyester short-sleeved rashguard from the market leader in women's BJJ gear is relatively thick and sturdy, but I didn't find it overly hot on its own. Under a gi was less comfortable, but then I don't like to wear any rashguard under a gi. It has a minimalist style, in keeping with the Fenom design ethos, along with the trademark Fenom quality. The waist felt wide at first, but this proved to be misleading: after several weeks of testing it has yet to ride up on my back. Available to buy here, in black with contrasting sleeves and side panels (currently, that's white, blue, purple or black. Brown is not an option). 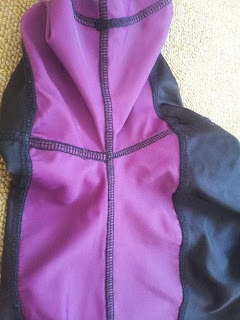 I've been wearing my purple Fenom rashguard in conjunction with the Pony Club Grappling Gear 'Jessica' spats (reviewed a couple of weeks ago). As with the 'Jessica' grappling tights, I'm going to take the excuse to investigate the history of rashguards (if you want to skip all that, click here). An article on the Australian Fitness Network suggests that compression wear was first used in a medical setting, "over 60 years ago" (the article isn't dated, but one of the sources is from 2011, so that probably means the '50s). The application was for the treatment of 'venous disorders' (such as deep vein thrombosis), which would fit with what I found in my previous research into compression tights. Ironically, surfing rash guards were invented by accident in Australia during the late 1970s. 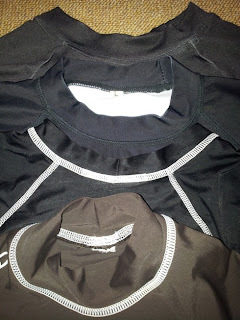 The original rash guards were simply lycra turtleneck shirts worn underneath a surfer's wetsuit with the exclusive purpose of preventing chafing caused by the wetsuit. As the water warmed in the spring and summer months, these Aussie surfers began to be seen in the waves wearing rash guard shirts with their board shorts without any wetsuit. Surfers found that a wetsuit rash guard was also very effective at protecting their skin from irritation caused by contact with their surfboard as well as preventing sunburns. Hence, a new surfing product was born! I'm not sure what source the author had for that, but it sounds plausible. For surfing and other water sports, the rash guard is normally used to - as its name suggests - prevent rashes from either the swimsuit or the surfboard, depending on if you're just wearing a rash guard and shorts. It also provides protection from the hot sun, a particularly important issue in ozone-layer deprived Australia. Flatlocking is used primarily for performance goods, it has fewer layers to chafe. It depends on what you want to do. If you’re running a marathon, you definitely want tights with a flatlock. An overlocked coverstitched seam, while it won’t pull apart, will chafe along your legs and cause bleeding. Flatlock stitching is achieved by lapping the neoprene together, this creates a FLAT, COMFORTABLE SEAM but it also allows water to penetrate slightly. [...] Flatlock is identified by a band of interlocked thread on both sides of the suit, sometimes in contrasting thread colour for visual effect. Jiu jitsu has long had a close connection to surfing, unsurprising given that BJJ's spiritual home looks out on the board-crammed beaches of Rio de Janeiro. Not by coincidence, the biggest BJJ hotspot outside of Brazil is California, which also happens to feature prominently in surfing history and culture. Hawaii is another area packed with both grapplers and surfers: it's arguably the most important location of all in surfing history, as discussed in this article. It was on the football field that he came up with his greatest idea. Plank noticed that, after a practice or a game, the cotton T-shirt that he and the other players wore under their pads would be heavy, soaked with sweat. He believed the extra weight hampered performance. He came up with an idea for a lightweight, sweat-wicking synthetic T-shirt, which he originally made from fabric found in women’s undergarments. Given the '90s date, it's equally possible that both sources fed into the use of rash guards for grappling. No-gi grapplers already using rashies from surf shops may perhaps have decided to try Under Armour style compression wear instead. Since then, rash guards have continued to increase in availability, meaning that today you can pick up a serviceable rashguard from your local sports shop or even Target/Wal-mart (I haven't seen them in British supermarkets yet). I'm not certain of the oldest website selling BJJ merchandise, but the first one that sprang to mind was OnTheMat. Looking at previous versions of their page, the earliest example dates back to April 2002, when they sold HCK rash guards (listed under 'Valley Tudo Gear', which must be an intentional typo). There is no mention of 'rash guard': it is simply called 'vale tudo short sleeve' and 'vale tudo top long sleeve'. That would indicate that it was in MMA that rash guards first made an appearance. According to the Wayback Machine, Howard Liu's site dates all the way back to at least December 1998 (the same year as the first ADCC, which has become the most prestigious no-gi grappling competition), selling four types of gi. By February 1999, Howard Combat Kimonos was proclaiming "New! HCK Vale Tudo Top and Shorts!" Although the link to those new products is unfortunately not in the Wayback Machine archive, I expect they were the same or similar as those sold through OnTheMat in 2002. It's also quite possible compression tops had been used in Brazil before that, but looking at some of the older BJJ manufacturers (like Atama, MKimonos, Krugans), their websites do not appear to go back beyond 2000. Having said that, the classic vale tudo sartorial style, especially in a hot country like Brazil, was to fight in speedos, before progressing to vale tudo shorts (which are similarly tight). My own first rashguard was from the now defunct XF Gear, bought back in 2007 in preparation for my no-gi debut at the Roger Gracie Academy. As I have never done a lot of no-gi (though I've been more regular recently), that rash guard is still in good shape, apart from the lettering on the front. Six years (but less than 40 no-gi lessons) down the line, the lettering has cracked and steadily flaked off. In the years since, sublimating has become the standard, which avoids that issue of all the lettering slowly wearing away. Sublimation has been with us for quite some time. In the early computer years, circa 1970s, special ribbons impregnated with sublimation particles were used with dot matrix impact printers to create monochrome transfers. The first computer output sublimation system was developed in the mid ‘70s by Wes Hoekstra as an application of his image processing work with the Jet Propulsion Lab in Pasadena, California. Wes has been credited with being the “father” of the computer image sublimation industry. When electrostatic printing became affordable in copying machines and laser printers, it wasn’t long before toner cartridges containing sublimation solids appeared on the market. This equipment is normally used to create single color or limited color transfers. Recent innovations in color copiers and laser printers, have permitted the creation of full color transfers using this method. The relevance to rashguards is that it permits more colourful and detailed designs, with the further advantage that sublimation is meant to prevent cracking, fading or peeling. Thus far, that has been the case with my Fenom rashguard after multiple washes. 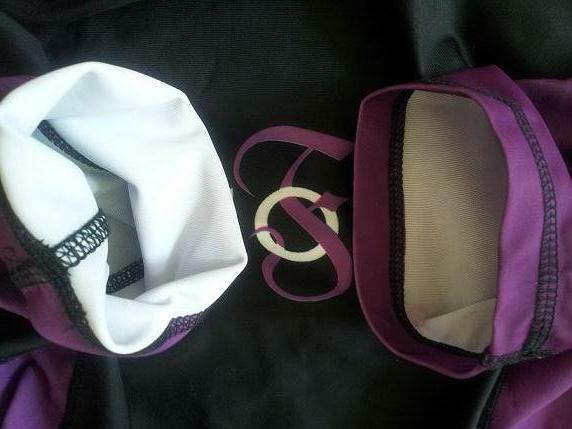 Its sublimated logo across the chest remains just as defined as when I unwrapped the packaging. That logo is the central embellishment, with a purple 'F'. There is no design on the back, so this rashguard should appeal to those who like an understated look. Inside, the Fenom rashguard is white, just like my PCGG spats. 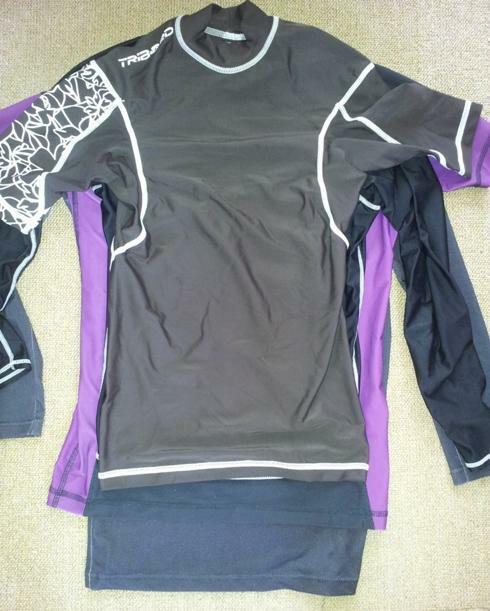 The body of the Fenom rash guard is black, with purple sleeves and side panels. The reason for that is some competitions, mainly IBJJF, require a certain percentage of the relevant rank on your rash guard when you compete. There are several other colours available from Fenom aside from purple, corresponding to the other belts of jiu jitsu: white, blue and black (for some reason, brown is currently missing). 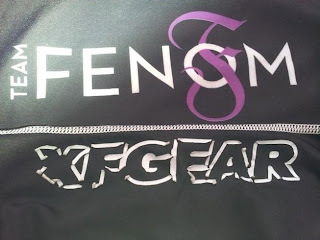 At present, the Fenom rash guard is only available with short sleeves that end above the elbow. My preference would be long sleeve, as that reduces the chance of mat burn on the elbows, or abrasion from the inside of the sleeve if you're wearing it under your gi. In my opening nogi test of the Fenom rash guard, I thought it felt a bit loose at the bottom and expected it to ride up, especially as I kept pulling it down during the warm up. However, it didn't ride up at all during sparring, where I spent a lot of time underneath side control and with people in my guard, meaning my back was constantly rubbing on the mat. This was when I was wearing the rashguard tucked into gi trousers, which I also tested tucked into shorts. 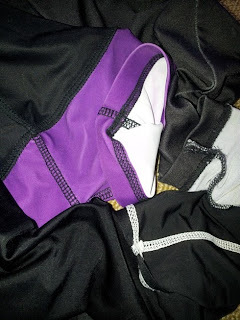 My Bullshido fight shorts are much looser, so unlike the trousers did not stay tight over the bottom of the rashguard. Either way, the Fenom rash guard continued to remain in place. Once my Pony Club spats arrived, I tested further configurations, wearing the rash guard over and under the tight leggings. Again, I found the Fenom rash guard never wriggled up my back or front, despite my constant expectation that it would. Presumably the reason for the wider lower part of the rash guard is because it is designed for the additional curves of a female body shape, but if you're a fairy slender man (like me), it appears to be a decent fit based on my testing. Comparing this to the three other rashguards I currently own (which includes a brown surfing rash guard I picked up for a few quid from a charity shop), the length of the Fenom 'Large' is comparable to my old XF Gear, but not as long as the Masaru rashie. 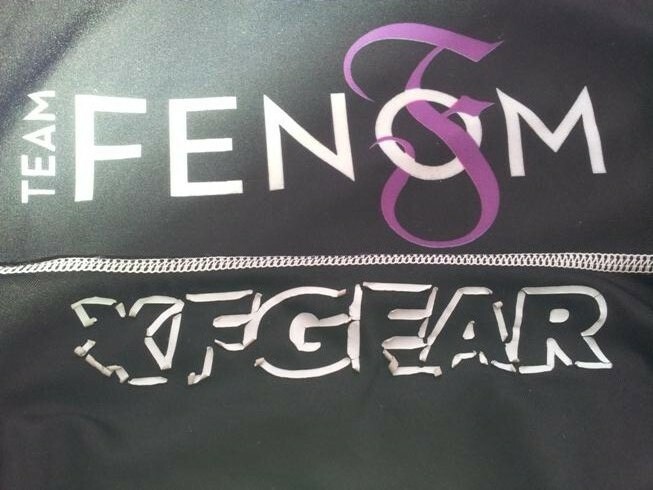 My XF Gear rashguard has certainly ridden up in the past: the difference between them is that the Fenom rashguard appears to be thicker with a white lining inside, which I guess must provide some friction. All of them except for the XF Gear have a raised collar by the neck, though the Fenom and Masaru are not as pronounced as the full turtle neck of the surfing rash guard. There has been no shrinkage, given that this is not cotton so is less prone to that problem. On Triin's advice I bought a Large, measuring 67cm from cuff to cuff (without stretching). Shoulder to hem is 62cm, with a sleeve width of 13cm and the waist comes to 41cm, if the rash guard is just lying flat on the floor. I normally wear 30" waist trousers and there is some give to this, so I would have thought you would still be ok if your waist is larger than that. However, it is tight across the chest and arms (as you would expect from a rash guard), so as ever, be careful when choosing your size. It is worth emailing Triin to ask what would fit you best, providing your measurements. For reference, my frame is 5'7" and 145lbs, with a chest about 35" (as this rashguard is aimed at women, I'm sure it can accommodate a lot more in that area) and my biceps are roughly 12", so I'm no beefcake. If you're similar, then a Large should fit you too. If you're much bigger, then that may be a problem: if you're smaller, you could go for a Medium or a Small. There was some slight bobbling at the back, with a small white area. 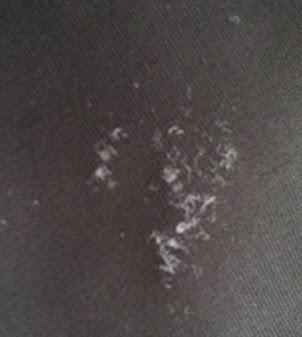 I am not certain where that came from: it could have been something velcro rubbing against it, either during training or in the washing machine. That's the only bit of damage I have noticed up until this point. The stitching is solid, with no loose threads that I could see. When I cycled in my Pony Club spats on a hot day a while back, I wore the Fenom rashguard on my upper body. 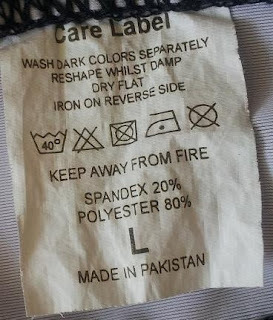 It was equally comfortable as the tights, so seems effective at keeping you cool and dry. It was less cool underneath a gi, but that's affected by my general discomfort wearing a rashguard under the gi: they always make me like I'm overheating. Hopefully there will be a long-sleeve option from Fenom in the future, either in this design or something entirely new, to prevent any rubbing on the elbows. The Fenom ranked rash guard is available to buy here, in black with contrasting sleeves and side panels (white, blue or purple). You can also select 'black', which is presumably solid black. Brown does not appear to be available at present (though that could mean they're just currently sold out). The rashguards are currently on sale at $29, so your size and colour may sell out. I'm guessing they will be restocked, but then Fenom t-shirts are not, so it's possible this is a one-time design which will change for the next batch. Thank you! Love reading your reviews, so much useful information. Looking forward to training with you again.